The sizes, capabilities, and performance of databases and their respective DBMSs have grown in orders of magnitude. These performance increases were enabled by the technology progress in the areas of processors, computer memory, computer storage, and computer networks. The development of database technology can be divided into three eras based on data model or structure: navigational, SQL/relational, and post-relational. The relational model, first proposed in 1970 by Edgar F. Codd, departed from this tradition by insisting that applications should search for data by content, rather than by following links. The relational model employs sets of ledger-style tables, each used for a different type of entity. Only in the mid-1980s did computing hardware become powerful enough to allow the wide deployment of relational systems (DBMSs plus applications). By the early 1990s, however, relational systems dominated in all large-scale data processing applications, and as of 2018[update] they remain dominant: IBM DB2, Oracle, MySQL, and Microsoft SQL Server are the most searched DBMS. The dominant database language, standardised SQL for the relational model, has influenced database languages for other data models. As computers grew in speed and capability, a number of general-purpose database systems emerged; by the mid-1960s a number of such systems had come into commercial use. Interest in a standard began to grow, and Charles Bachman, author of one such product, the Integrated Data Store (IDS), founded the "Database Task Group" within CODASYL, the group responsible for the creation and standardization of COBOL. In 1971, the Database Task Group delivered their standard, which generally became known as the "CODASYL approach", and soon a number of commercial products based on this approach entered the market. IBM also had their own DBMS in 1966, known as Information Management System (IMS). IMS was a development of software written for the Apollo program on the System/360. IMS was generally similar in concept to CODASYL, but used a strict hierarchy for its model of data navigation instead of CODASYL's network model. Both concepts later became known as navigational databases due to the way data was accessed, and Bachman's 1973 Turing Award presentation was The Programmer as Navigator. IMS is classified[by whom?] as a hierarchical database. IDMS and Cincom Systems' TOTAL database are classified as network databases. IMS remains in use as of 2014[update]. For instance, a common use of a database system is to track information about users, their name, login information, various addresses and phone numbers. In the navigational approach, all of this data would be placed in a single record, and unused items would simply not be placed in the database. In the relational approach, the data would be normalized into a user table, an address table and a phone number table (for instance). Records would be created in these optional tables only if the address or phone numbers were actually provided. Just as the navigational approach would require programs to loop in order to collect records, the relational approach would require loops to collect information about any one record. Codd's suggestions was a set-oriented language, that would later spawn the ubiquitous SQL. Using a branch of mathematics known as tuple calculus, he demonstrated that such a system could support all the operations of normal databases (inserting, updating etc.) as well as providing a simple system for finding and returning sets of data in a single operation. In the 1970s and 1980s, attempts were made to build database systems with integrated hardware and software. The underlying philosophy was that such integration would provide higher performance at lower cost. Examples were IBM System/38, the early offering of Teradata, and the Britton Lee, Inc. database machine. Larry Ellison's Oracle Database (or more simply, Oracle) started from a different chain, based on IBM's papers on System R. Though Oracle V1 implementations were completed in 1978, it wasn't until Oracle Version 2 when Ellison beat IBM to market in 1979. In Sweden, Codd's paper was also read and Mimer SQL was developed from the mid-1970s at Uppsala University. In 1984, this project was consolidated into an independent enterprise. The 1980s ushered in the age of desktop computing. The new computers empowered their users with spreadsheets like Lotus 1-2-3 and database software like dBASE. The dBASE product was lightweight and easy for any computer user to understand out of the box. C. Wayne Ratliff, the creator of dBASE, stated: "dBASE was different from programs like BASIC, C, FORTRAN, and COBOL in that a lot of the dirty work had already been done. The data manipulation is done by dBASE instead of by the user, so the user can concentrate on what he is doing, rather than having to mess with the dirty details of opening, reading, and closing files, and managing space allocation." dBASE was one of the top selling software titles in the 1980s and early 1990s. The 1990s, along with a rise in object-oriented programming, saw a growth in how data in various databases were handled. Programmers and designers began to treat the data in their databases as objects. That is to say that if a person's data were in a database, that person's attributes, such as their address, phone number, and age, were now considered to belong to that person instead of being extraneous data. This allows for relations between data to be relations to objects and their attributes and not to individual fields. The term "object-relational impedance mismatch" described the inconvenience of translating between programmed objects and database tables. Object databases and object-relational databases attempt to solve this problem by providing an object-oriented language (sometimes as extensions to SQL) that programmers can use as alternative to purely relational SQL. On the programming side, libraries known as object-relational mappings (ORMs) attempt to solve the same problem. XML databases are a type of structured document-oriented database that allows querying based on XML document attributes. XML databases are mostly used in applications where the data is conveniently viewed as a collection of documents, with a structure that can vary from the very flexible to the highly rigid: examples include scientific articles, patents, tax filings, and personnel records. NoSQL databases are often very fast, do not require fixed table schemas, avoid join operations by storing denormalized data, and are designed to scale horizontally. In recent years, there has been a strong demand for massively distributed databases with high partition tolerance, but according to the CAP theorem it is impossible for a distributed system to simultaneously provide consistency, availability, and partition tolerance guarantees. A distributed system can satisfy any two of these guarantees at the same time, but not all three. For that reason, many NoSQL databases are using what is called eventual consistency to provide both availability and partition tolerance guarantees with a reduced level of data consistency. NewSQL is a class of modern relational databases that aims to provide the same scalable performance of NoSQL systems for online transaction processing (read-write) workloads while still using SQL and maintaining the ACID guarantees of a traditional database system. Databases are used to hold administrative information and more specialized data, such as engineering data or economic models. Examples include computerized library systems, flight reservation systems, computerized parts inventory systems, and many content management systems that store websites as collections of webpages in a database. An in-memory database is a database that primarily resides in main memory, but is typically backed-up by non-volatile computer data storage. Main memory databases are faster than disk databases, and so are often used where response time is critical, such as in telecommunications network equipment. A cloud database relies on cloud technology. Both the database and most of its DBMS reside remotely, "in the cloud", while its applications are both developed by programmers and later maintained and used by end-users through a web browser and Open APIs. A deductive database combines logic programming with a relational database. A document-oriented database is designed for storing, retrieving, and managing document-oriented, or semi structured, information. Document-oriented databases are one of the main categories of NoSQL databases. An embedded database system is a DBMS which is tightly integrated with an application software that requires access to stored data in such a way that the DBMS is hidden from the application's end-users and requires little or no ongoing maintenance. Sometimes the term multi-database is used as a synonym to federated database, though it may refer to a less integrated (e.g., without an FDBMS and a managed integrated schema) group of databases that cooperate in a single application. In this case, typically middleware is used for distribution, which typically includes an atomic commit protocol (ACP), e.g., the two-phase commit protocol, to allow distributed (global) transactions across the participating databases. An array DBMS is a kind of NoSQL DBMS that allows modeling, storage, and retrieval of (usually large) multi-dimensional arrays such as satellite images and climate simulation output. Operational databases store detailed data about the operations of an organization. They typically process relatively high volumes of updates using transactions. Examples include customer databases that record contact, credit, and demographic information about a business's customers, personnel databases that hold information such as salary, benefits, skills data about employees, enterprise resource planning systems that record details about product components, parts inventory, and financial databases that keep track of the organization's money, accounting and financial dealings. Connolly and Begg define Database Management System (DBMS) as a "software system that enables users to define, create, maintain and control access to the database". The DBMS acronym is sometime extended to indicated the underlying database model, with RDBMS for relational, OODBMS or ORDBMS for the object (orientated) model and ORDBMS for Object-Relational. Other extensions can indicate some other characteristic, such as DDBMS for a distributed database management systems. It is also generally to be expected the DBMS will provide a set of utilities for such purposes as may be necessary to administer the database effectively, including import, export, monitoring, defragmentation and analysis utilities. The core part of the DBMS interacting between the database and the application interface sometimes referred to as the database engine. Often DBMSs will have configuration parameters that can be statically and dynamically tuned, for example the maximum amount of main memory on a server the database can use. The trend is to minimise the amount of manual configuration, and for cases such as embedded databases the need to target zero-administration is paramount. Early multi-user DBMS typically only allowed for the application to reside on the same computer with access via terminals or terminal emulation software. The client–server architecture was a development where the application resided on a client desktop and the database on a server allowing the processing to be distributed. This evolved into a multitier architecture incorporating application servers and web servers with the end user interface via a web browser with the database only directly connected to the adjacent tier. A general-purpose DBMS will provide public application programming interfaces (API) and optionally a processor for database languages such as SQL to allow applications to be written to interact with the database. A special purpose DBMS may use a private API and be specifically customised and linked to a single application. For example an email system performing many of the functions of a general-purpose DBMS such as message insertion, message deletion, attachment handling, blocklist lookup, associating messages an email address and so forth however these functions are limited to what is required to handle email. External interaction with the database will be via an application program that interfaces with the DBMS. This can range from a database tool that allows users to execute SQL queries textually or graphically, to a web site that happens to use a database to store and search information. A programmer will code interactions to the database (sometimes referred to as a datasource) via an application program interface (API) or via a database language. The particular API or language chosen will need to be supported by DBMS, possible indirectly via a pre-processor or a bridging API. Some API's aim to be database independent, ODBC being a commonly known example. Other common API's include JDBC and ADO.NET. Data query language (DQL) – allows searching for information and computing derived information. Database storage is the container of the physical materialization of a database. It comprises the internal (physical) level in the database architecture. It also contains all the information needed (e.g., metadata, "data about the data", and internal data structures) to reconstruct the conceptual level and external level from the internal level when needed. Putting data into permanent storage is generally the responsibility of the database engine a.k.a. "storage engine". Though typically accessed by a DBMS through the underlying operating system (and often using the operating systems' file systems as intermediates for storage layout), storage properties and configuration setting are extremely important for the efficient operation of the DBMS, and thus are closely maintained by database administrators. A DBMS, while in operation, always has its database residing in several types of storage (e.g., memory and external storage). The database data and the additional needed information, possibly in very large amounts, are coded into bits. Data typically reside in the storage in structures that look completely different from the way the data look in the conceptual and external levels, but in ways that attempt to optimize (the best possible) these levels' reconstruction when needed by users and programs, as well as for computing additional types of needed information from the data (e.g., when querying the database). Occasionally a database employs storage redundancy by database objects replication (with one or more copies) to increase data availability (both to improve performance of simultaneous multiple end-user accesses to a same database object, and to provide resiliency in a case of partial failure of a distributed database). Updates of a replicated object need to be synchronized across the object copies. In many cases, the entire database is replicated. Database access control deals with controlling who (a person or a certain computer program) is allowed to access what information in the database. The information may comprise specific database objects (e.g., record types, specific records, data structures), certain computations over certain objects (e.g., query types, or specific queries), or using specific access paths to the former (e.g., using specific indexes or other data structures to access information). Database access controls are set by special authorized (by the database owner) personnel that uses dedicated protected security DBMS interfaces. A database built with one DBMS is not portable to another DBMS (i.e., the other DBMS cannot run it). However, in some situations, it is desirable to move, migrate a database from one DBMS to another. The reasons are primarily economical (different DBMSs may have different total costs of ownership or TCOs), functional, and operational (different DBMSs may have different capabilities). The migration involves the database's transformation from one DBMS type to another. The transformation should maintain (if possible) the database related application (i.e., all related application programs) intact. Thus, the database's conceptual and external architectural levels should be maintained in the transformation. It may be desired that also some aspects of the architecture internal level are maintained. A complex or large database migration may be a complicated and costly (one-time) project by itself, which should be factored into the decision to migrate. This in spite of the fact that tools may exist to help migration between specific DBMSs. Typically, a DBMS vendor provides tools to help importing databases from other popular DBMSs. After designing a database for an application, the next stage is building the database. Typically, an appropriate general-purpose DBMS can be selected to be used for this purpose. A DBMS provides the needed user interfaces to be used by database administrators to define the needed application's data structures within the DBMS's respective data model. Other user interfaces are used to select needed DBMS parameters (like security related, storage allocation parameters, etc.). When the database is ready (all its data structures and other needed components are defined), it is typically populated with initial application's data (database initialization, which is typically a distinct project; in many cases using specialized DBMS interfaces that support bulk insertion) before making it operational. In some cases, the database becomes operational while empty of application data, and data are accumulated during its operation. Sometimes it is desired to bring a database back to a previous state (for many reasons, e.g., cases when the database is found corrupted due to a software error, or if it has been updated with erroneous data). To achieve this, a backup operation is done occasionally or continuously, where each desired database state (i.e., the values of its data and their embedding in database's data structures) is kept within dedicated backup files (many techniques exist to do this effectively). When this state is needed, i.e., when it is decided by a database administrator to bring the database back to this state (e.g., by specifying this state by a desired point in time when the database was in this state), these files are used to restore that state. Static analysis techniques for software verification can be applied also in the scenario of query languages. In particular, the *Abstract interpretation framework has been extended to the field of query languages for relational databases as a way to support sound approximation techniques. The semantics of query languages can be tuned according to suitable abstractions of the concrete domain of data. The abstraction of relational database system has many interesting applications, in particular, for security purposes, such as fine grained access control, watermarking, etc. Database logs – This helps in keeping a history of the executed functions. Graphics component for producing graphs and charts, especially in a data warehouse system. Query optimizer – Performs query optimization on every query to choose an efficient query plan (a partial order (tree) of operations) to be executed to compute the query result. May be specific to a particular storage engine. Increasingly, there are calls for a single system that incorporates all of these core functionalities into the same build, test, and deployment framework for database management and source control. Borrowing from other developments in the software industry, some market such offerings as "DevOps for database". The first task of a database designer is to produce a conceptual data model that reflects the structure of the information to be held in the database. A common approach to this is to develop an entity-relationship model, often with the aid of drawing tools. Another popular approach is the Unified Modeling Language. A successful data model will accurately reflect the possible state of the external world being modeled: for example, if people can have more than one phone number, it will allow this information to be captured. 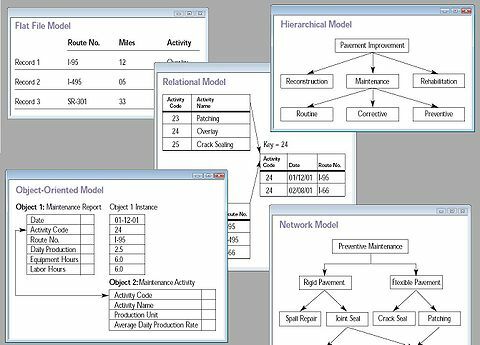 Designing a good conceptual data model requires a good understanding of the application domain; it typically involves asking deep questions about the things of interest to an organization, like "can a customer also be a supplier? ", or "if a product is sold with two different forms of packaging, are those the same product or different products? ", or "if a plane flies from New York to Dubai via Frankfurt, is that one flight or two (or maybe even three)?". The answers to these questions establish definitions of the terminology used for entities (customers, products, flights, flight segments) and their relationships and attributes. The final stage of database design is to make the decisions that affect performance, scalability, recovery, security, and the like, which depend on the particular DBMS. This is often called physical database design, and the output is the physical data model. A key goal during this stage is data independence, meaning that the decisions made for performance optimization purposes should be invisible to end-users and applications. There are two types of data independence: Physical data independence and logical data independence. Physical design is driven mainly by performance requirements, and requires a good knowledge of the expected workload and access patterns, and a deep understanding of the features offered by the chosen DBMS. The internal level (or physical level) is the internal organization of data inside a DBMS. It is concerned with cost, performance, scalability and other operational matters. It deals with storage layout of the data, using storage structures such as indexes to enhance performance. Occasionally it stores data of individual views (materialized views), computed from generic data, if performance justification exists for such redundancy. It balances all the external views' performance requirements, possibly conflicting, in an attempt to optimize overall performance across all activities. The conceptual view provides a level of indirection between internal and external. On one hand it provides a common view of the database, independent of different external view structures, and on the other hand it abstracts away details of how the data are stored or managed (internal level). In principle every level, and even every external view, can be presented by a different data model. In practice usually a given DBMS uses the same data model for both the external and the conceptual levels (e.g., relational model). The internal level, which is hidden inside the DBMS and depends on its implementation, requires a different level of detail and uses its own types of data structure types. Database technology has been an active research topic since the 1960s, both in academia and in the research and development groups of companies (for example IBM Research). Research activity includes theory and development of prototypes. Notable research topics have included models, the atomic transaction concept, and related concurrency control techniques, query languages and query optimization methods, RAID, and more. ^ Ullman & Widom 1997, p. 1. ^ "Update – Definition of update by Merriam-Webster". merriam-webster.com. ^ "Retrieval – Definition of retrieval by Merriam-Webster". merriam-webster.com. ^ "Administration – Definition of administration by Merriam-Webster". merriam-webster.com. ^ Tsitchizris & Lochovsky 1982. ^ Nelson & Nelson 2001. ^ "TOPDB Top Database index". pypl.github.io. ^ IBM Corporation (October 2013). "IBM Information Management System (IMS) 13 Transaction and Database Servers delivers high performance and low total cost of ownership". Retrieved Feb 20, 2014. ^ Hershey & Easthope 1972. ^ "Oracle 30th Anniversary Timeline" (PDF). Retrieved 23 August 2017. ^ Connolly & Begg 2014, p. 64. ^ Connolly & Begg 2014, pp. 97–102. ^ Connolly & Begg 2014, p. 102. ^ Connolly & Begg 2014, pp. 106–113. ^ Connolly & Begg 2014, p. 65. ^ Halder & Cortesi 2011. ^ Ben Linders (January 28, 2016). "How Database Administration Fits into DevOps". Retrieved April 15, 2017. ^ a b Date 2003, pp. 31–32. Beynon-Davies, Paul (2003). Database Systems (3rd ed.). Palgrave Macmillan. ISBN 978-1403916013. Chapple, Mike (2005). "SQL Fundamentals". Databases. About.com. Archived from the original on 22 February 2009. Retrieved 28 January 2009. Childs, David L. (1968a). "Description of a set-theoretic data structure" (PDF). CONCOMP (Research in Conversational Use of Computers) Project. Technical Report 3. University of Michigan. Childs, David L. (1968b). "Feasibility of a set-theoretic data structure: a general structure based on a reconstituted definition" (PDF). CONCOMP (Research in Conversational Use of Computers) Project. Technical Report 6. University of Michigan. Chong, Raul F.; Wang, Xiaomei; Dang, Michael; Snow, Dwaine R. (2007). "Introduction to DB2". Understanding DB2: Learning Visually with Examples (2nd ed.). ISBN 978-0131580183. Retrieved 17 March 2013. Codd, Edgar F. (1970). "A Relational Model of Data for Large Shared Data Banks" (PDF). Communications of the ACM. 13 (6): 377–387. doi:10.1145/362384.362685. Connolly, Thomas M.; Begg, Carolyn E. (2014). Database Systems – A Practical Approach to Design Implementation and Management (6th ed.). Pearson. ISBN 978-1292061184. Halder, Raju; Cortesi, Agostino (2011). "Abstract Interpretation of Database Query Languages" (PDF). Computer Languages, Systems & Structures. 38 (2): 123–157. doi:10.1016/j.cl.2011.10.004. ISSN 1477-8424. Hershey, William; Easthope, Carol (1972). A set theoretic data structure and retrieval language. Spring Joint Computer Conference, May 1972. ACM SIGIR Forum. 7 (4). pp. 45–55. doi:10.1145/1095495.1095500. Nelson, Anne Fulcher; Nelson, William Harris Morehead (2001). Building Electronic Commerce: With Web Database Constructions. Prentice Hall. ISBN 978-0201741308. North, Ken (10 March 2010). "Sets, Data Models and Data Independence". Dr. Dobb's. Archived from the original on 24 October 2010. Tsitchizris, Dionysios C.; Lochovsky, Fred H. (1982). Data Models. Prentice–Hall. ISBN 978-0131964280. Ullman, Jeffrey; Widom, Jennifer (1997). A First Course in Database Systems. Prentice–Hall. ISBN 978-0138613372. Lightstone, S.; Teorey, T.; Nadeau, T. (2007). Physical Database Design: the database professional's guide to exploiting indexes, views, storage, and more. Morgan Kaufmann Press. ISBN 978-0-12-369389-1.